The jet sweep play in youth football is an extremely explosive play. The jet motion is an immediate threat to the outside and will force the defense to adjust or get beat. It will allow our offense to attack the edge of the defense quickly with our RB receiving the ball while running full speed. It will force the defense to roll or slant their defense to the motion side. Once they roll to the motion side they will open themselves up for other plays off of jet. Only need to block three defenders to gain a large amount of yardage or even a touchdown. This is a great play if you do not have a decent offensive line or if you are undersized. Gets your athletes out in space quickly. Makes the defense tackle in space. The quarterback will open up with his back to the defense, hiding the ball from the defense. Easy to implement on any age level of youth football. You can have the jet motion back run out for a pass, lead, or kick out block. There are a lot of things you can do with the jet motion player. Can run jet sweep out of pretty much any formation. Very fun for the kids to execute. Parents & players will love it. Motion player cannot go or lean forward until the ball is snapped. Must stay horizontal to the line of scrimmage. Motion needs to be at full speed. Want the running back to receive the ball running full speed. The motion timing is the most challenging aspect because every player will differ in speed. It is the QB’s job to get the timing and snap count down. This will come with reps. A good starting point is having the QB/center snap the ball when the motion player is between the tackle and guard. Again, depends on age and speed. It takes reps, but the kids will catch on quickly. Motion creates an unbalanced formation. Motion kills man to man coverage. Many times they do not even run with or keep up with the motion player running across the formation. The first play you should install is the jet sweep. This is an outside hitting play, the running back must get outside. QB must carry out fakes to the opposite side. Once the defense stops respecting the QB fake, hit them with waggle or a QB run off jet action. On this sweep from the wing t formation we have the wide receiver cheat down and crack the defensive end. When the defense starts to over play the sweep you can bring the WR down and crack a DE or OLB that is slanting or playing wide to stop the sweep. We will still be able to run jet even though the defense is adjusting. You can see we brought the TE over to give us an extra blocker. We love doing this because the defense doesn’t even realize we are unbalanced, at least early on. We call this our “heavy” formation. We want to get right to the line of scrimmage get set and run this play. We do not want to give the defense time to notice and adjust to the unbalanced. Running jet sweep out of the shotgun will allow you to utilize a mobile QB. You can do a couple of different plays off of jet sweep action. The QB can keep the ball and run behind the jet motion player. The QB can run a counter, trap, or ISO/Power off of the jet sweep action as well. If you have a duel threat QB I would suggest running it out of shotgun, especially on the older levels. Once the defense over plays the jet motion, hit them with QB trap. You can have the 2 fill for the pulling guard or he can fake lead blocking. The great thing about the shotgun formation is that it makes the defense account for the QB as a running threat. This takes away their extra man advantage. Jet sweep is also very effective out of the spread offense. There are a couple of different ways you can execute this play in the spread. You can have the 4 stalk block the SS (defender covering him) or you can have him crack like shown in the diagram. You do not have to pull the play-side guard, you can just have him step play-side and look to cut off defenders pursuing to the ball carrier. I would suggest running the jet out of the spread like the diagram illustrates. Having the 4 stalk block the corner is asking a lot. That is a difficult block for him to hold. Having the guard pull out and block the SS will allow the jet motion back to cut right off of the block. 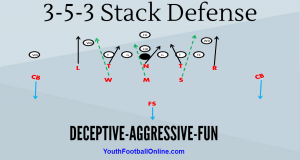 Plus, the crack block is super effective in youth football. If you are getting man to man coverage you can have the X run the corner off. The X needs to split out really wide to take the CB out of the game. If the corner is play off (giving cushion) or playing up in cover 2 the X must stalk block him. There are a couple of ways you can run the jet to the TE side. You can have the TE pull out and lead block or you can have the guard pull and lead block. You can even have the 2 cheat over and have him lead block. After running the jet to the SE side mostly, you will catch the defense off guard running it to the TE side. Keep them honest. If you are running jet sweep and you see the defense isn’t running with the motion player have him motion right out into a pass pattern. This is almost always open. The jet sweep play in youth football is underutilized. The jet is a play that will get your athletes the ball out in space quickly. Even if you do not have fast players, the jet will get them outside in a hurry. If you do not have speed on your team it is vital that you are able to get outside. Even if your kids aren’t fast, the jet sweep play will make them fast. The jet sweep in youth football will take some time to install but once the kids get the timing down it will dominate.